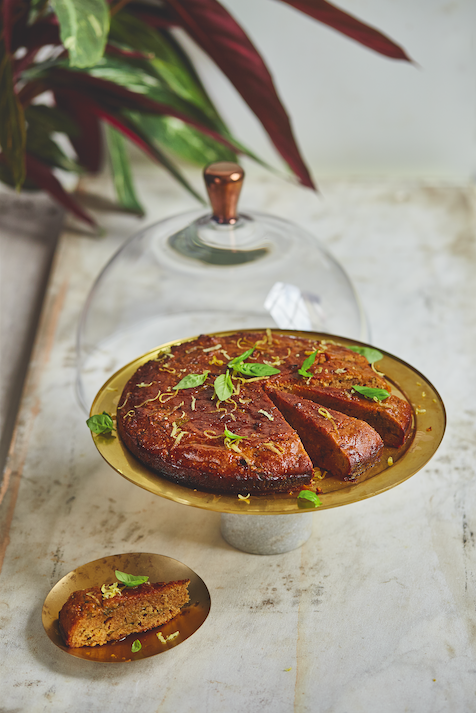 I love cakes that are flavoured with herbs, such as rosemary and fennel, and the light aniseed flavour of basil gives a new dimension to a lemon cake. My other half loves lemon tarts and cakes, but I usually find them too sharp, so I’ve created this — an olive oil, almond sponge, made lighter with tapioca and given a herby aroma with the fresh basil. For any cake connoisseurs who want to make this even lighter, feel free to whip up the whites and all that jazz, but I usually put the ingredients straight into the food processor and whizz away before stirring in the basil by hand. Bake as mini cakes or cupcakes, if you like — they’ll need less time in the oven. This is also delicious with limes, which are more cooling and less harsh than lemons. If you have East by West, find this cake on page 95. Preheat the oven to 180ºC (fan 160ºC/gas mark 4), and grease a 23cm (9in) round springform tin with olive oil. Mix together the ground almonds, tapioca, baking powder and salt in a large bowl. Whisk together all the remaining ingredients in a separate bowl. Then add the wet mixture into the dry mixture and stir until well combined. Pour the mixture into the prepared tin, smooth with a wet spatula and bake for 30 minutes or more, until the middle is set and a toothpick comes out almost clean. Allow to cool completely in the tin. Meanwhile, make the glaze by whisking the ingredients together in a glass jug. Pour the glaze over the cake. Allow to stand for another 30 minutes. I managed to get enough juice and zest for this recipe from 2 large lemons, but I’d recommend having a third lemon on hand just in case, especially if you are decorating with extra zest.